Demonstrators sit on a street during a protest in Buenos Aires, Argentina, March 15, 2017. People are protesting to demand more social help from Mauricio Macri's government. Argentina's largest union announced a one-day general strike on April 6, increasing pressure on President Mauricio Macri's center-right government six months before mid-term congressional elections. The CGT says Macri's policies, including austerity measures like reducing subsidies on fuel and electricity, are resulting in lower real salaries and lost jobs. “There are many reasons why this strike has been called and hopefully it will cause the government to reconsider and really listen to the most needy sectors,” Carlos AcunaPena, a CGT leader, said on local television. Argentina's President Mauricio Macri addresses the media during a news conference in Buenos Aires, Feb. 16, 2017. The CGT has staged protests in recent weeks, but April 6 would be the first general strike in Argentina since Macri took office in December 2015 promising to attract investment and restore economic growth. The strike announcement comes amid tough salary negotiations between provincial governments and teachers' unions that delayed the start of school for many children. While Macri had some early success negotiating with unions, clinching labor deals with oil and auto workers to lower labor costs, the recent struggles may worry investors who want to see more reforms pass congress after the October vote. Macri's reforms caused inflation to spike to around 40 percent in 2016, when the economy contracted. There have recently been some signs of improvement however, including positive month-on-month economic growth in November and December. On Thursday the statistics agency said the unemployment rate was 7.6 percent in the fourth quarter of 2016, down from 8.5 percent in the third quarter. 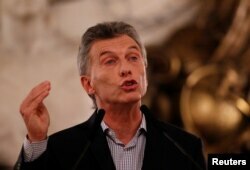 Macri's Cabinet Chief Marcos Pena on Wednesday blamed former leftist President Cristina Fernandez for inciting unrest ahead of the election. “We can't let ourselves be taken by those voices that want and need the change we are bringing about to fail,” he said in a news conference.